Minnetonka departed Braemar Arena late in the evening of Jan. 25, smarting from a 8-2 blowout by Edina. First-year Skippers hockey coach Sean Goldsworthy worried how his boys would respond. To his delight, practice the next day felt loose and fun. Players rode the good vibes another 24 hours, winning 5-0 at Wayzata. They haven’t lost since, taking a 10-game winning streak and the top seed into the Class 2A tournament quarterfinals Thursday at Xcel Energy Center. Living in the moment, eschewing regret, were welcomed reminders for Goldsworthy. His late father, flamboyant and popular North Stars forward Bill Goldsworthy, helped shape him as a player. His coaching role model was a man he called his “second father,” Whitey Aus, whom Goldsworthy played for at St. Olaf and then succeeded as coach. 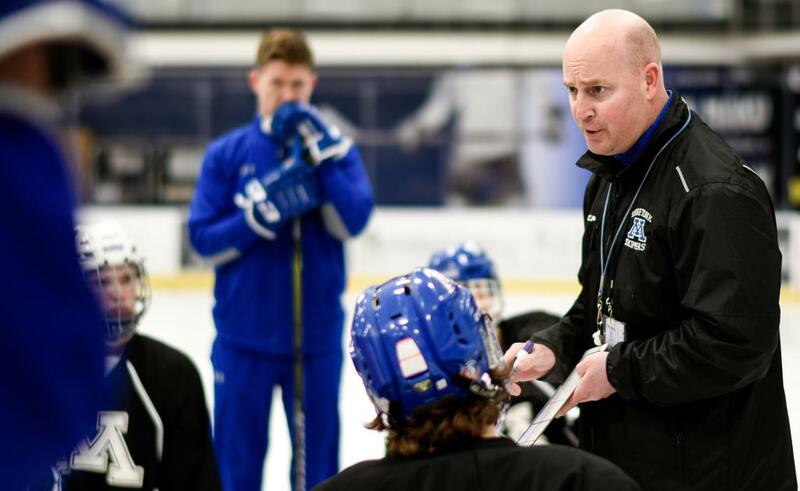 Less than a year into pondering an uncertain coaching future, Goldsworthy accepted the Minnetonka job and returned to his hockey roots. He served as captain on the 1989-90 Minnetonka team that placed third at the state tournament. His wife, Amy, and their daughters — Madigan, Emma and Lauren — endorsed the decision. His own enthusiasm fit the locker room like a broken-in skate. Minnetonka went undefeated in its first 13 games as Goldsworthy found himself matching wits with coaches he used to consult on the recruiting trail: Edina’s Curt Giles, Hill-Murray’s Bill Lechner, and St. Thomas Academy’s Tom and Greg Vannelli. Goldsworthy inherited a team bursting with potential, led by forwards Loheit (committed to Minnesota Duluth), Bobby Brink (Denver), Joe Molenaar, Jack Bayless and defensemen Josh Luedtke (Northern Michigan) and Andrew Hicks. Defeating Edina two out of three times moved the Skippers to No. 1. A double-­overtime defeat of Holy Family Catholic clinched their first state tournament appearance since 2010. Earning teammates’ respect is a family tradition. Bill Goldsworthy, who died in 1996, had been a North Stars captain. Sean’s oldest daughter, Madigan, captained Northfield’s team as a senior this winter. Loheit, his nephew, is one of two Skippers wearing the “C”. “Being a good teammate means understanding your value on the team as well as other people’s value,” Goldsworthy said. On Monday this week, former Bloomington Jefferson coach Tom Saterdalen addressed the Skippers at practice. Saterdalen, a five-time state champion, coached the late Steve Molenaar, captain of the Jaguars’ 1984 team and father of senior co-captain Joe Molenaar. The message resonated with players and Goldsworthy alike: Live in the now.